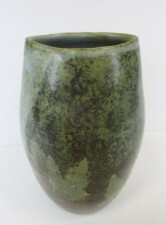 Studio potter Mike Child makes a lot of very varied pieces, using all sorts of style of decoration. 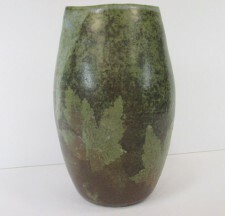 This stoneware vase is an unusual shape, an elegant curve with a cut out curve to the top edge. It has a soft patterning with gentle images of leaves, from natural pieces used in the decorative process. 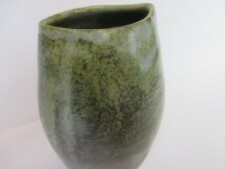 The vase shows the wealth of experience of the maker, who lives in Ramgate, Kent. The vase is approximately 12cm tall.